In the following review about American Metabolix Keto Meal, we’ve examined critical aspects about it – like its ingredients and what price it’s offered at. We also assessed the trustworthiness of the manufacturer to help potential customers decide if they should purchase this particular supplement to help them get into a state of ketosis. Beta hydroxybutyrate is a naturally occurring ketone in the human body. In fact, it is the most abundant circulating ketone. A recent study established that taking outside beta hydroxybutyrate increases levels of it in the blood. These ketones are then used by the muscles and brain as an energy source. Just as importantly, the ketones caused the mitochondria, which are the energy producing parts of a cell, to increase the levels of certain intermediates that actually reduced the cells’ reliance on carbohydrates for energy. This means that not only does beta hydroxybutyrate act as an energy source but it also causes the body to increase its breakdown of fats and produce more ketones. The magnesium and calcium that are paired with the beta hydroxybutyrate can be used to improve muscle contraction and relaxation. The coconut oil medium chain triglycerides and egg protein act as a source of nutrients which can be converted to ketones when the body moves to this metabolic state. The supplement is taken in a powder form. One to two scoops can be mixed with 12 oz of water and taken three times a day – as a breakfast, as a meal replacement and just before bed. The ingredients are mixed in a ratio of 75% fat 20% protein and 5% carbohydrates. There are some allergens in this product like whey, coconut and soy lectin. For people who aren’t allergic to any of those ingredients, no major side effects can be expected. People who have a chronic medical condition and pregnant and nursing mothers should consult a physician before using this supplement. A one-time purchase will cost a customer $79.99 which excludes shipping and taxes. The manufacturer offers a subscription service which grants customers a 10% discount. The subscription grants the customer a chance to receive a regular orders that are determined by the customer. The manufacturer offers a 100% money back guarantee so the customers will receive a full refund if they return the product within 30 days. The manufacturer does not share whether they exclude opened and used products. We find the ingredients present in the supplement to be well considered because there is a fair amount of scientific research to back them up. We don’t believe that the inclusion of these ingredients warrants the massive price that this manufacturer is asking for though. Customers are not receiving any more benefits from paying for this more expensive supplement than they would when looking at other manufacturer’s products, many of which are cheaper. It’s true that they offer a subscription discount and a guarantee, but the subscription discount is far less than some of the bulk order discounts that other manufacturers offer and the guarantee is just too short to test the product sufficiently. 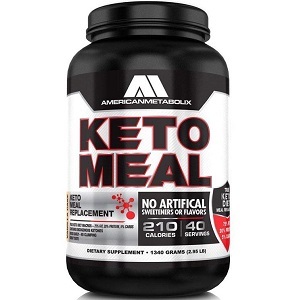 John Parker	reviewed American Metabolix Keto Meal	on December 13th	 and gave it a rating of 3.